Through the recently approved CLOUD experiment, CERN will soon be contributing to climate research. Tests are being performed on the first prototype of CLOUD, an experiment designed to assess cosmic radiation influence on cloud formation. 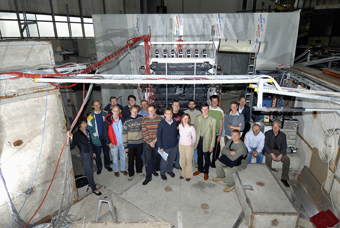 Part of the CLOUD team in front of their prototype detector (hidden from view in a tent) in the T11 beamline of the CERN PS. It's a world first - a particle beam being used to study the climate. Tests on a prototype that will eventually lead to the CLOUD experiment (Cosmics Leaving OUtdoor Droplets) have just started. A beam of pions supplied by the PS accelerator will simulate a cosmic ray shower colliding with the prototype. The principal objectives of this initial phase are to test CLOUD's technical design and, at the same time, conduct the first studies in a particle beam of the influence of cosmic rays in the formation of low-altitude cloud layers. 'If we manage to highlight significant interaction, then cosmic rays can be taken into consideration in future climate models', explains CLOUD experiment spokesman Jasper Kirkby. Climate trends are governed by complex mechanisms. When modelling the climate a whole array of parameters needs to be taken into account. Not a single one of the models used by climatologists today incorporates cosmic rays, which could play an important role. Meteorological records reveal that temperature variations on the earth's surface are uncannily well correlated with cosmic ray variations. These data are obtained by paleoclimatologists, among others, who, by analysing core samples taken from the polar ice cap, are able to reconstitute both the climate and the level of cosmic radiation. They have observed that the temperature on the Earth's surface falls when cosmic radiation increases. Satellite observations also appear to suggest that the Earth's low-altitude cloud cover is linked to the intensity of cosmic rays. That is where the idea for the CLOUD experiment was born. The phenomenon is explained by the role cosmic rays apparently play in the formation of aerosols and in the development of the cloud layer. It is the mystery behind these physical mechanisms that CLOUD will attempt to unravel. The experiment comprises a two-metre- diameter reaction chamber and a 50cm- diameter cloud chamber in which very precise atmospheric conditions can be reproduced. In other words, these giant pressure-cookers will create clouds. 'It'll be a bit like cooking. We'll put all the ingredients in the pot, 'sprinkle' on some cosmic rays, and see what happens', says Jasper Kirkby. The two chambers will be bristling with measurement and control instruments - spectrometers, ice-crystal detectors, CCD cameras, etc., which will make it possible to understand cosmic-ray-related cloud formation mechanisms on a microscopic scale. CLOUD is an interdisciplinary experiment. With 18 institutes from nine different countries participating, the collaboration comprises Europe's and the USA's most eminent physicists specialising in aerosols and clouds, together with other experts on the sun and in the cosmic ray and particle physics fields. The experiment will be ready to take data in earnest in 2010. Cosmic radiation comprises particles accelerated at high energy coming from the interstellar medium. It is mainly composed of protons. Cosmic rays essentially come from the explosion of 'supernovae', an event that occurs when certain stars reach the end of their lifetime. The Sun too emits cosmic rays, but at lower energies. Three factors may explain the variations in the intensity of cosmic rays according to increasing scales of time - variations in the solar wind, changes in the Earth's magnetic field and the Sun's movement in the galaxy.